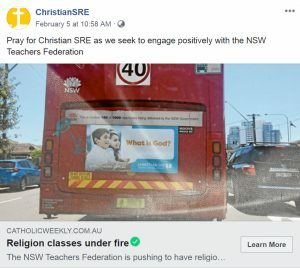 In the face of the threat of falling attendance figures for Special Religious Education (SRE aka ‘scripture’) and opposition from peak bodies representing professional educators in NSW, the scripture lobby are desperately trying to market their damaged and out-of-date product in 21st Century multi-cultural and multi-belief NSW society. 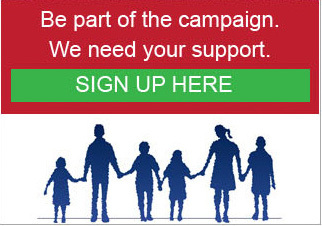 With the marketing campaign for SRE have come misleading and dubious statements in all forms of media. In many cases, FIRIS ignores them as indications of the desperation of SRE apologists and lobbyists. However, every now and then an article is published or statements are made which are so easily seen as gross misrepresentations of the facts that FIRIS has to respond. One classic example is the SRE lobby’s proclamation of their respect for ‘choice’. More recent examples are articles in the Catholic Weekly and J-Wire (the digital Jewish news daily for Australia and New Zealand). These articles were written in response to the announcement by the NSW Teachers Federation of their new policy position regarding the removal of SRE from NSW public schools. The only ‘NSW government Independent Review of SRE’ conducted in the last 39 years was carried out by ARTD Consultants in 2015. The final report was given to the Department in March 2016 but was not released to the public until April 2017. …thanks for pointing out this error. The study quoted was actually the Study of Special Religious Education and its Value to Contemporary Society co-authored by Associate Professor Zehavit Gross at Bar-Ilan University in Israel and Sydney University’s Professor Emerita, Suzanne Rutland. It was presented to the NSW Premier at the Parliamentary Celebration of SRE in 2018. The article has been amended. We apologise for the error. There is a huge difference between this ‘study’ and the review commissioned by the Department. Therefore, to mistake the two may be seen by a reasonable member of the NSW public as pretty sloppy journalism. Whatever, the case may be, it seems that getting their facts straight is a hard thing to do for SRE apologists and those with vested interests. However, as in the case of the first article discussed above, FIRIS is not sure what other ‘NSW Government’s Independent Review of SRE released in 2017′ the Bishop could be referring to. 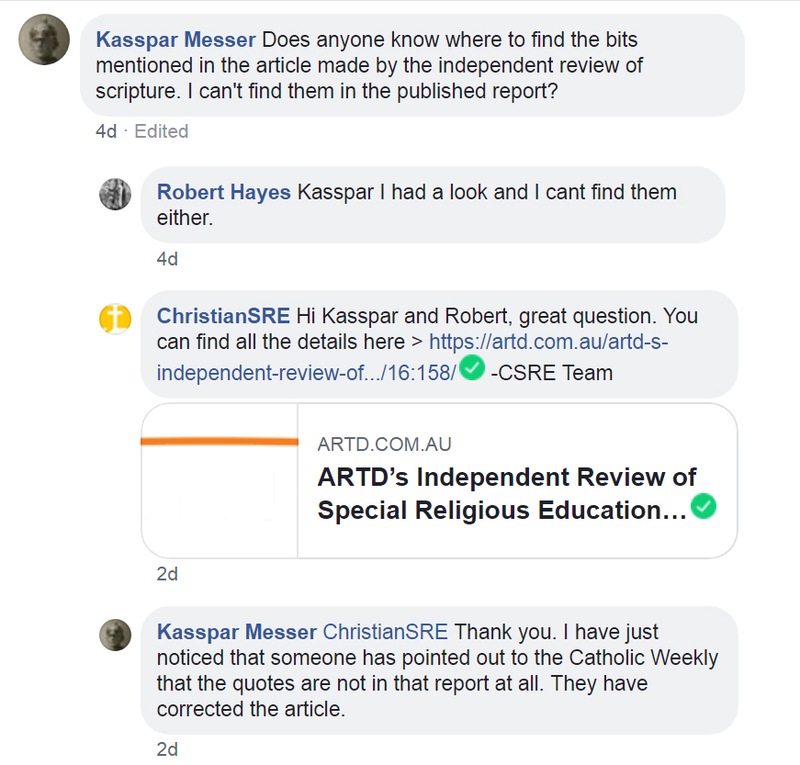 It could not be the 2015 Review of SRE and SEE conducted by ARTD Consultants because an investigation into the benefits of SRE and SEE was not within the scope of the Terms of Reference. Unfortunately, the reviewers did not regard the contributions of those who documented existing and foreseeable risks related to the presence of SRE in our public schools, or those who perceive SRE as unbeneficial and potentially harmful to students, as being pertinent to their assessment of the implementation of SRE. – a reasonable member of the NSW public might be justified in starting to regard the attribution of the limited study’s findings to the ARTD review, and the questionable references to the Review, as far too convenient ‘mistakes’ made in order to serve the desperate interests of the scripture lobby. 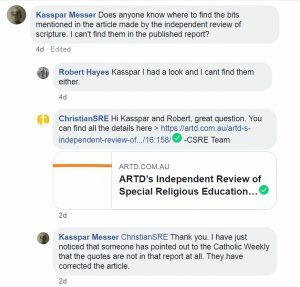 ChristianSRE were quick to share the article and even when asked by a supporter to provide references for the statements in question included in the first article above, they continued to link the references to the ARTD Independent Review rather than identify the error in the journalist’s statements. All of the above demonstrates that SRE providers and apologists are far too often, at best, ignorant of information that they should not be ignorant of but are nevertheless unwise enough to comment on, or, at worst, they intentionally provide misleading information in an attempt to make SRE appear to the uncritical and unquestioning eye as that which it is not. 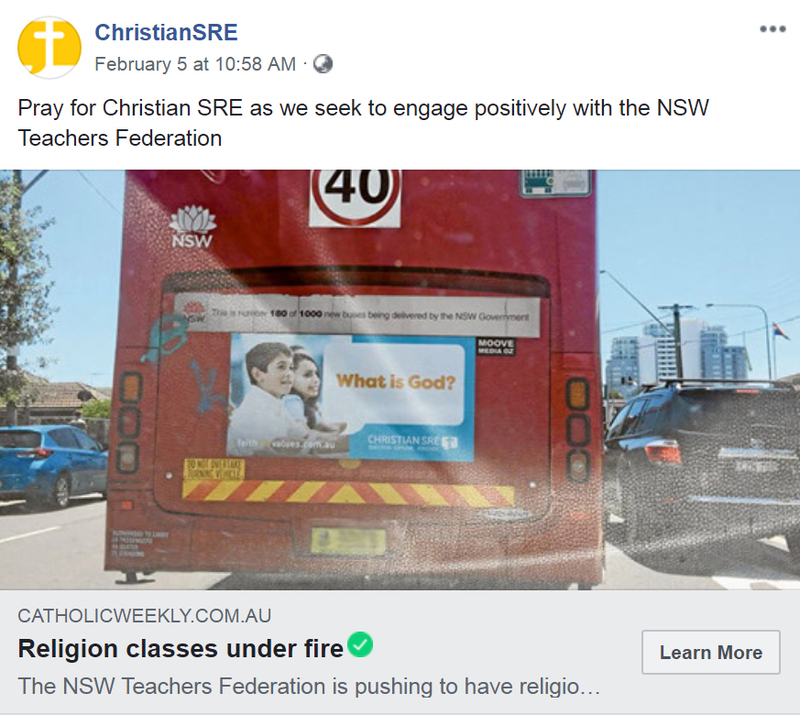 Either way, it is no wonder that the peak bodies representing professional educators, including the NSW Teachers Federation and the Secondary Principals’ Council, have had enough oand want SRE removed from NSW public schools.